In times of total romanticism there are key historic symbolisms in mind, like a magic small blue box, certainly an icon to 'love me for ever'. In a more contemporary approach to a classic, last November 2017 on Fifth Avenue, Tiffany & Co. has opened the door to its first ever retail-dining concept. Finally the Holly Golightly of our times can drink her coffee inside the 'Blue Box Cafe' & stop steering at the window display from the sidewalk. As part of a larger renovation the Parisian Designers Ronan & Erwan Bouroullec have created a space to reflect a 'modern luxury experience' (according with Reed Krakoff, chief artistic officer of Tiffany & Co.) using the inherited blue tones & finishes like herringbone marble & amazonite stone to reclaim the elegance convey in known film 'Breakfast at Tiffany's' in 1961. Bouroullec also celebrated Parisian craftsmanship up to the last detail. Creating an interior with a feeling of modern romanticism will require soft & cosy textures; alike velvet, wool & silk combined with hard & coldish sophisticated surfaces like marble, glass & metal. Consider this including rugs & wall coverings too as they always add to a space a degree of higher design. In stead of a more common approach with a big velvet patted upholstered seat I suggest to create a modern cuddling space with a Bubble Curved sofa. It has some nostalgia but with a very current feeling, this can also been accompanied by a mixed colour wooly rug. A well selected playful rug like Acqua Alta Giudecca by CC-Tapis can be a brilliant choice as peaceful yet wild. When taking cuddling to the next level a gorgeous screen can help you get into something more comfortable. Solanio upholstered screen was designed by Matteo Cibic who is using a magnificent printed textile that resembles the marble wall at Blue Box Cafe, bringing immediate sofiticaticon to the room. A secret mirror hides behind for the vain as beauty is part of romance. Another way to mimic the amazonite sophistication at Tiffany's could be Francesco Meda's Split Round table on verde mediterranio marble accompanied of almost any upholstered full back chair, the importance lays on the marble sitting gracefully in the room. I would also suggest a little vanity corner with vibrant patterned wall covering like this Nobilis with a touch of Art Deco character to match this a gorgeous velvet & fringes pouff. Lorenza Bozzolis' collection is simply fabulous, not only the proposal of design but the colour selection is to dye for, they will bring a bit of drama to any dressoir! So to bring back a subtle calmness Saint Louis By Ceccotti has all the characteristics; white light, brass insert & a blue-grey porcelain piece, certainly romantic. These scenario is my modern interpretation of Deniot's bathroom in Foch, which was Tiffany's blue with Parisian classic style. Romance craves intimacy so for those moments I like the input at Furniture Designer Danielle Moudaber's home in London where we find this intimate corner showing great use of a tight space. Adding texture to this monochrome room I would place a romantic wall with flowers designed by Lacroix blooming on the wall in company of an also nature inspired armchair like the Odea by Roche Bobois in a similar yet more vigorous colour & sitting over a sweet Mint Popsycle rug. Solanio: Screen made of brass, fabric & mirror. L135xW127x181Hcm. Design by Matteo Cibic for Bonotto Editions. Couture: Pouff with fringes. by Lorenza Bozzoli Design. Palette: Desk in stained ash veneer & satined polished bras. L140xD62x83Hcm. Design by Jaime Hayon for &traditions. Wynwood: Wall covering from the cosmopolitan 2 collection. Nobilis Paris. Rocaille: Wall paper in aqua tone. Design by Christian Lacroix for Designers Guild. Wishing to express this wild romanticism with a touch of nostalgia, we can deepen ourself into shades from blue grey to dark mint or mint all the way to emerald green. This way we can apply a touch of Tiffany's to any interior either for residential or commercial purposes, as shown in the selection below. As a final thought of inspiration, during the movie Holly Golightly speaks about the 'mean reds' (which I see well used by Danielle Moudaber lighting choice) 'when you are afraid & suddenly you don't know what are you afraid off...' 'then I like to jump into a cab & go to Tiffanys, it calms me right away, the quietness & the proud look of it, nothing happens to you there...if I could find a real life place that makes me feel like Tiffanys, then I buy some furniture & give the cat a name.' I hope you find all the ingredients to make your home becomes the place that makes you feel like Tiffanys! A playground to exceed expectation by mega-monochroming or balance colour & interior style, or simply adding a touch of nostalgic blue. The possibilities are endless yet for me the most current & perhaps unintentionally fabulously romantic is London home of Danielle Moudaber, what an urban palace. London home & Design by Danielle Moudaber as seen in AD España issue September 2017/ foto from another source. Jean Louis Deniot interior in Foch, France. We can play with monochrome colours or a simple suggestive complementing detail, you can go as far as you want. In either case these colour range seams to bring that piece of calmness we are looking for. Remember to incorporate suitable lighting too, tenuous yet bright in character. I say due of the proportions if you are looking for a real look you got to go for it! There to go full on colour with some metallic finishes, touches of soft textures & geometric patterns. From retail-dinning to coffee shops & hotel restaurants & rooms. 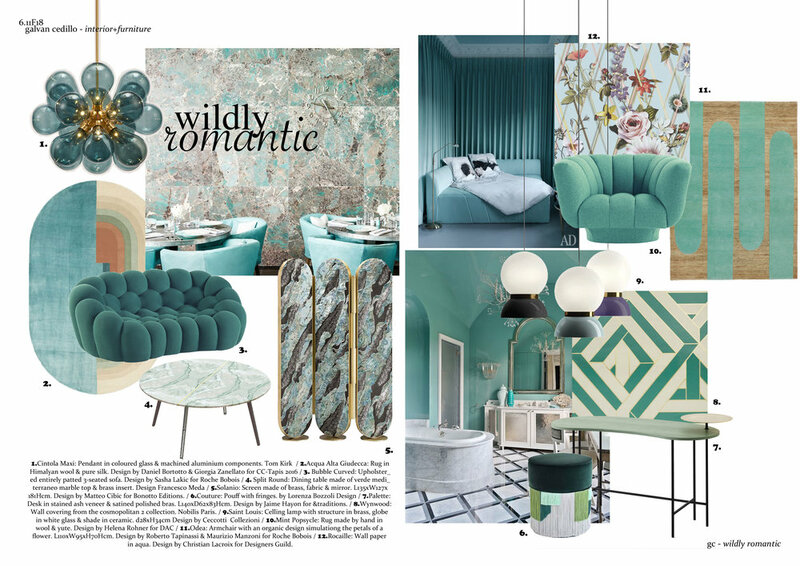 We find shades from blue grey to dark mint or mint all the way to emerald green to create marvellous spaces to accent your lust for a wild romance! Radisson Blue Royal Hotel, Room 606 Design by Jaime Hayon in Copenhagen. Bar Botanique Design by 3WO in Amsterdam as seen in ELLE Decoration NL Canal House issue #1 2017/ foto from another source. Hôtel National des Arts et Métiers Design by Raphael Navot & Francis Ford Coppola.